We stock a large range of fruit juices which are produced in Kent. 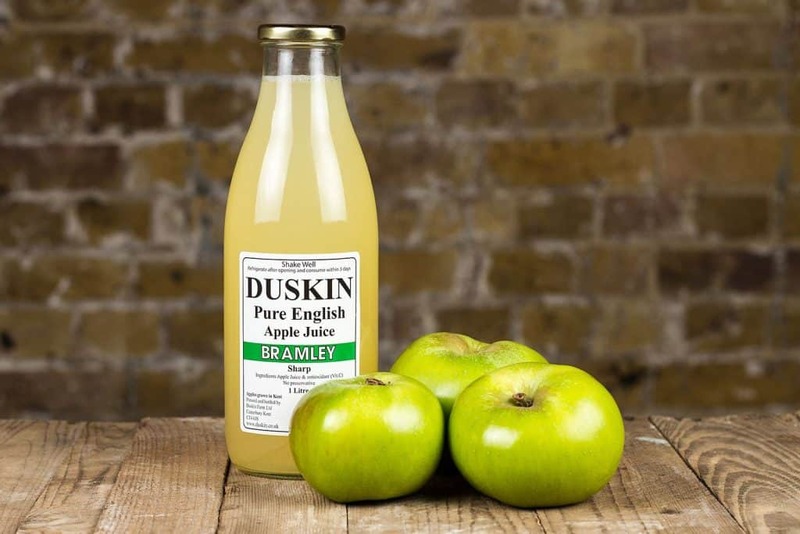 Not only are they made in Kent, but they use fruits grown in the county's orchards. This not only guarantees freshness, but the quality is assured. Produce on our home farm has been grown naturally without chemical sprays or pesticides since approximately the year 2000. By working with nature and growing plants that are strong & healthy with a natural resistance to pests & diseases, in turn produces fruit & vegetables which are full of flavour, with the added benefit of being free from chemicals. Growing high quality, award-winning fruit from apples and pears to plums and apricots, on the idyllic sun-drenched south-facing slopes overlooking the Weald of Kent. These beautiful orchards span over 10 sites encompassing 450 acres of breath-taking Kent countryside all within a stone’s throw of the farm’s original site and home to where we; the Bardsley family still live today. Apple Juice - Crisp and juicy award-winning Cox apples are hand-picked and pressed to produce this deliciously refreshing and quintessentially English drink. Pear Juice - The sweet and juicy Conference pear, the mellow earthy Comice and the vanilla noted Concorde are hand-picked and blended together to produce a mouth-watering mixture. Kent is often referred to as the Garden of England, with good reason, and every good garden should have an apple tree if it possibly can. Kent is lucky, it has thousands of them. At Duskin Farm, we are privileged enough to not only live in this Garden but also to bottle it. Kentish apples are grown, pressed and bottled in Kent. Pure natural spring water from the chalk aquifer of the North Downs, Kingsdown Natural Spring Water, still and sparkling, is available in beautifully designed stylish glass bottles and is enjoyed as the perfect accompaniment to fine food in restaurants and hotels across the United Kingdom and beyond. The simplicity and elegance of the Kingsdown design reflect the purity of the brand. The first bottle of Kingsdown rolled off the production line in June 1995. The business was founded by William Bomer and began life as a small family business. Since then Kingsdown has flourished – our production site and head office is based at the Kingsdown source on the North Downs, we have an established distribution depot in south-east London, and Kingsdown is stocked by hotels, restaurants, bars, and clubs throughout the United Kingdom and beyond, with export markets ranging from South Korea to the United Arab Emirates.